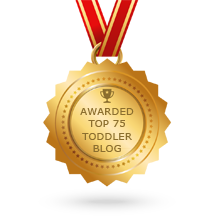 The Benefits of Risky Play - Joyful Toddlers! A few days ago I heard an interview on NPR asking the question, “Is It Time to Bring Risk Back Into Our Kids’ Playgrounds?” (didn’t hear it? You can read about it here.) Spoiler alert: the answer is YES! They talked about how exposure to controlled risk through play is an important part of learning and establishing a person’s risk tolerance in other areas of life even into adulthood. Children are very good at self-regulating their exposure to physical risks if given the chance, practicing again and again until they can approach an activity with confidence. In giving examples of appropriately risky play, people come back again and again to being outdoors in nature. Descriptions of damming streams to catch frogs, having campfires for young children, or the Forest Kindgergarten movement started in Germany, are all prime examples. 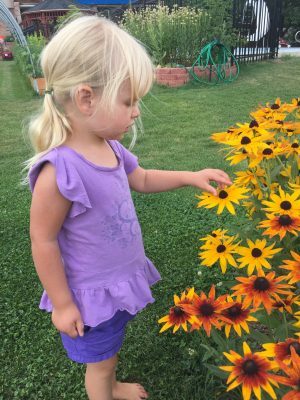 Nature has ledges, sharp corners, drop-offs, loose parts, mud and other slippery surfaces, poky objects, and many other ways to explore, conquer, get hurt, jump up and brush yourself off, and set out again. The space changes over time. It can be interesting and stimulating in all the right ways. Most of the playgrounds designed for young children in the United States are so over-safe that all of the nature has removed. One daycare I visited, the caregiver proudly told me that the children got time outdoors every day. Each classroom had one outdoor play structure covered with plastic, on a bed of rubber, with a strip of concrete for riding bikes on one side. The whole thing was surrounded on all four sides AND on top by chain link fencing; the “roof” was threaded with a screen to filter the sunlight. In my mind, I referred to them as “play cages” for the children. The entire environment was strictly controlled. 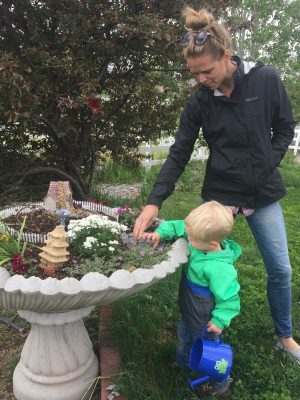 If you have a young child and you don’t happen to live in the woods, or live near a preschool that has campfires every morning, how can you find good outdoor space for your children to explore? Many parks don’t actually have much nature other than grass, and there aren’t many comfortable spots for parents, either! 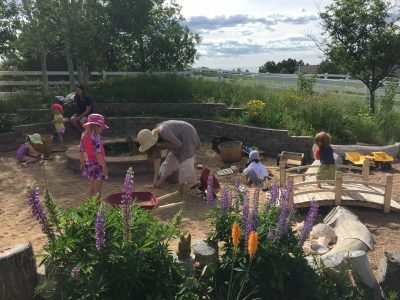 If you happen to live near Arvada, Colorado, I invite you to enroll in my Play Garden classes. 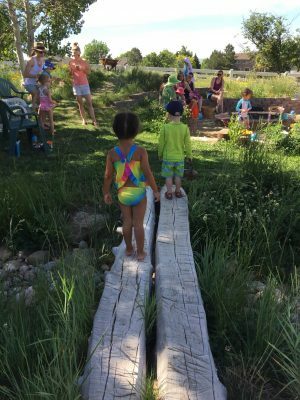 These are outdoor parent-child classes that take place in a safe-but-not-too-safe space that is filled with nature! It’s got sand, slides, tunnels and play-houses for the children, and shade and comfortable seating for the adults. We alternate times of free play with songs, games, and a healthy snack. Our Spring Session is starting in mid-April! I’m also offering Summer and Autumn sessions. To learn more or register, click here. 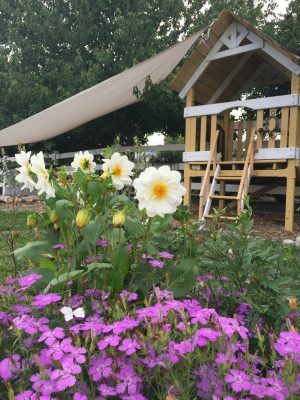 If you don’t live nearby, I want to encourage you to search for more natural play spaces near you, or why not start making some play spaces for yourself! My Play Garden classes take place in our back yard. Yes, I’ve put a lot of time and effort into it, and I started out with with earth-moving equipment. But since then I’ve been on my own. Every season I work on new projects and plant more flowers. A lot of these projects are cheap. I got this play house for free off of Craig’s List and put a lot of elbow grease and love into it. I’m currently making a mud kitchen out of benches that I got from my in-laws when they moved, and a kitchen sink for $20 at the Habitat for Humanity ReStore (I’ll do a separate blog post about that). This Fairy Garden was made from the base of an old fountain that was left behind by the previous owners of my house. And of course, I would be remiss to leave out the flowers! 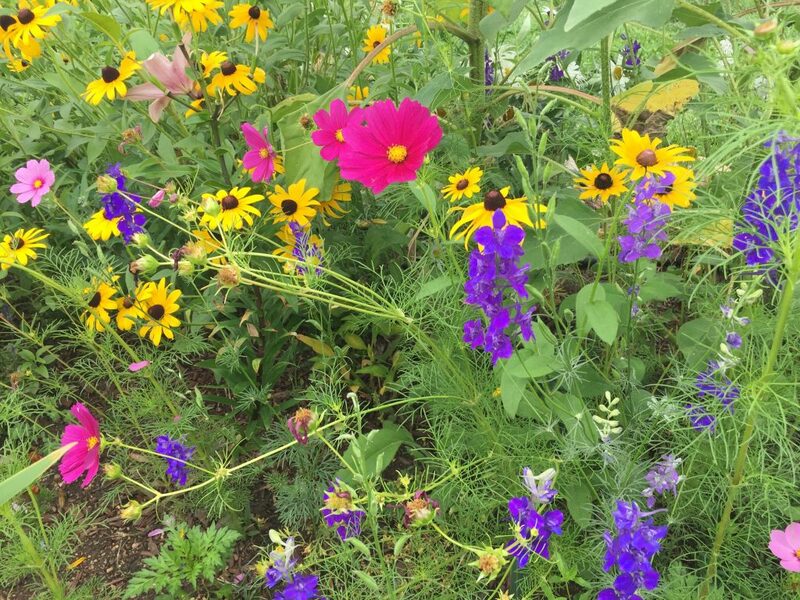 I have been attending and arranging plant swaps, shopping bargain bins late in the season, begging cuttings from friends and neighbors, and have started hundreds of flowers from seed. Right now in March there are just a few tiny flowers, but come July…what a riot of color, scent, and sensation! My goal is to have so many flowers that I don’t care if the children pick them.